Blog traffic is often a hit and miss field and often even the best posts, with the catchiest headlines can go unnoticed. There’s nothing as disappointing. However, there are all sorts of ways to increase your chances of being seen and read. The traditional social media sites are a start, although the issue is that everyone uses them and so this compounds the noise and reduces the chance of being seen. This is why using smaller networks; with more focused audiences is often a significantly better bet. Both Q&A site Quora and another slightly lesser known site, called Empire Avenue are great assets in this area. If you haven’t heard of Empire Avenue, it’s a social network with social media marketing tools included and uses gamification to push content to other social networks. It’s ideal for small business and those involved in social media marketing as these are its main clients – it is worth checking out. Of course aside from alternative sites such as Quora and Empire Avenue, the best way to be seen is to do something compelling and different. 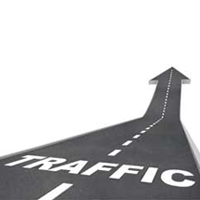 So, here are some great ways to grab notice and increase your blog traffic. You may not have heard of Dubbler. It’s a phone app that allows you to record a minute of audio via your phone and then allows you to add a cover image. It’s a great way to convey what your post is about verbally and can be shared within the Dubbler community and also on Facebook and Twitter. Just add your blog post URL in the description area and you will hopefully grab some interest. Vine is another great way to create interest and doing so in a similar way to Dubbler and posting on both Vine and other social media sites creates more interest. Twitter will help you here and automatically displays the video when it’s tweeted. SlideShare receives over 50m unique visitors a month and five times as many business owners per head than any other site. So, why not create an overview of your post on SlideShare and then include a link to the original. It will be searchable within the site and can be shared on social networks too. This is another great small social network and another one that can drive traffic. With over 100m users a month, Instagram is fast becoming a notably large presence on the web. Sharing an image with an overlaid post title is a good way to improve traffic. Also, remember that Instagram is also hashtag friendly and you can utilise them to really help push those posts and in turn people to your blog. These are another great place to add blogs. Contributor boards are fantastic as they allow your fellow contributors to see the pin, as well as people that follow them. The more members, the more exposure you receive. There are all sorts of innovative ways to increase blog traffic. Does anyone have any ideas to add? Something unconventional perhaps? Let me know in the comments.